The survivors have a funeral for Boone, and Locke shows up to tell everyone how Boone died, and Jack flips his lid, just a little bit. With the blood he gave in the transfusion, he's in a weakened state, so Kate drugs him so he'll rest for a while and get his strength back. 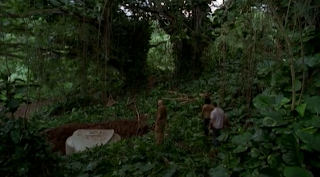 Sayid has become suspicious of Locke, and goes with him out into the jungle to find the plane that Boone was in when he fell. While they're out there, Locke admits to Sayid that he destroyed his transceiver and knocked Sayid out when he was originally trying to triangulate the position of Rousseau's distress signal. Jack wakes up and realizes the key around his neck is missing, and Sayid realizes that Shannon took it to get a gun out of the briefcase to kill Locke. They find her pointing a gun at Locke, but Sayid stops her. Charlie can't get Aaron to stop crying, until he discovers that the baby likes the sound of Sawyer's voice. Dr. Arzt tells Michael that they need to launch the boat as soon as possible, although we find out shortly thereafter in a mobisode that Arzt didn't really know what he was talking about. When Kate finds out that they're leaving the next day, she tries to get her way onto the raft at the expense of Sawyer. Locke takes Sayid and Jack out to the jungle to see the hatch that he and Boone had discovered. Jack wants to open it, and Sayid thinks that's ridiculous and that the hatch door should stay closed. Michael gets sick while working on the boat, and Jack discovers that someone poisoned his water. Walt confides in Locke that he didn't poison his dad, then tells him not to open the hatch. Kate's shenanigans gets Michael to distrust Sawyer, and Michael tells him he's off the raft, so Sawyer sells Kate out and tells everyone that she was the one on the plane who was in handcuffs. Jack figures out that it was Sun that poisoned Michael, because she didn't want Jin to go and was actually trying to get him sick instead. But as the episode closes we find that it was Kate's idea to poison the water, connecting back to Kate drugging Jack's water to knock him out. The episode runs 58:28 and is 481MB to download. You can stream below (via Facebook), or go here to use torrents (better quality, recommended) to download the episodes to your computer.